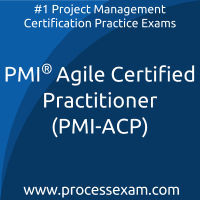 This is probably the best source online for preparing for PMI Agile Practitioner. This I am saying with my experience with at Processexam.com and with other where I have tried before I landed here. Nothing better than here in terms of Quality questions, Platform, exam format, everything just perfect. Do not think of going anywhere else, just go for this PMI-ACP practice exam and you will rock the exam. I have purchased the premium access almost 10 days before and using it for my preparation from then. I have very smooth experience within the term of question quality, the accuracy of answers, the exam platform, and overall website performance. I am taking certification exam soon, will post exam the experience also. As of now, full marks to the website. Today I have passed the Agile Practitioner certificate exam with Above target. A big thanks to the Processexam practice tests. Thank u.